“You Better Eat to Survive!” is a two-player virtual reality game that involves eating real food to survive and ultimately escape from a virtual island. Eating is sensed through capturing chewing sounds via a low-cost microphone solution. Unlike many VR games that stimulate mostly visual and auditory senses, “You Better Eat to Survive!” integrates the gustatory sense not just as an additional game input, but as an integral element to the game experience: we use the fact that with head-mounted displays, players cannot see what they are eating and have to entrust a second player outside the VR experience to provide them with food and feeding him/her. With this game, we demonstrate that eating can be an intriguing interaction technique to enrich VR experiences while offering complementary benefits of social interactions around food. Peter presents the thinking behind the combination of VR and eating at the ACM SIGCHI Conference on Human Factors in Computing Systems (CHI) in Denver, CO, USA, May 2017. An interim video of an earlier version of the game. 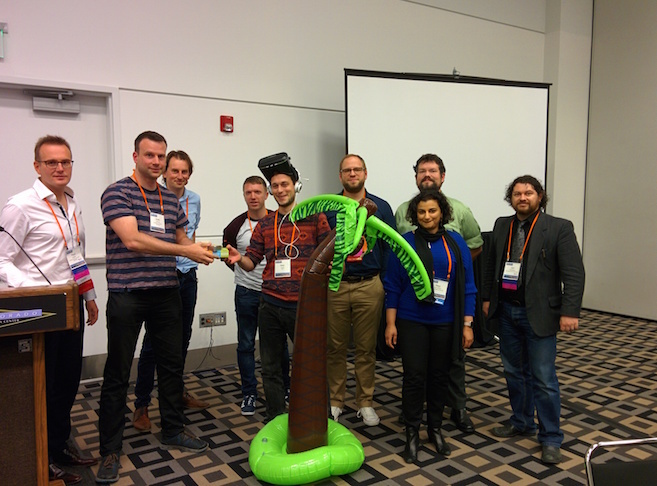 “You Better Eat to Survive!” won the first prize at the CHI 2017 Student Game Competition, category “Innovative Interface”. “You Better Eat to Survive!” developed by Peter Arnold with Rohit Khot and Florian ‘Floyd’ Mueller. Arnold, P. You Better Eat to Survive! 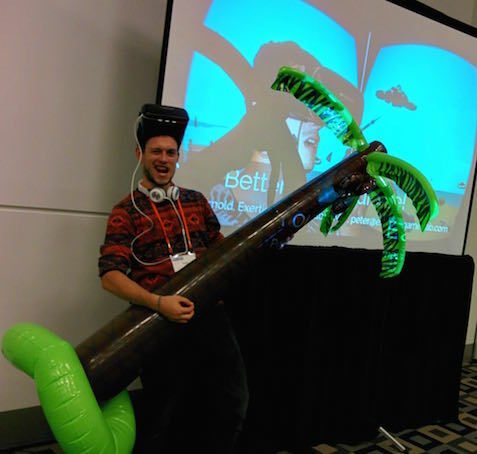 Exploring Edible Interactions in a Virtual Reality Game. CHI 2017. Student Game Competition. Proceedings of the 2017 CHI Conference Extended Abstracts on Human Factors in Computing Systems. 206-209. Arnold, P., Khot, R. A., & Mueller, F. You Better Eat to Survive: Exploring Cooperative Eating in Virtual Reality Games. Proceedings of the Twelfth International Conference on Tangible, Embedded, and Embodied Interaction. TEI 2018. Long paper. ACM. 398-408.